Above: Simplified Diagram of the smallpox virus (Variola) replicative cycle (life cycle or replication). Image measures 600 pixels across, original image is 4,000 pixels across but has NO LABELS. 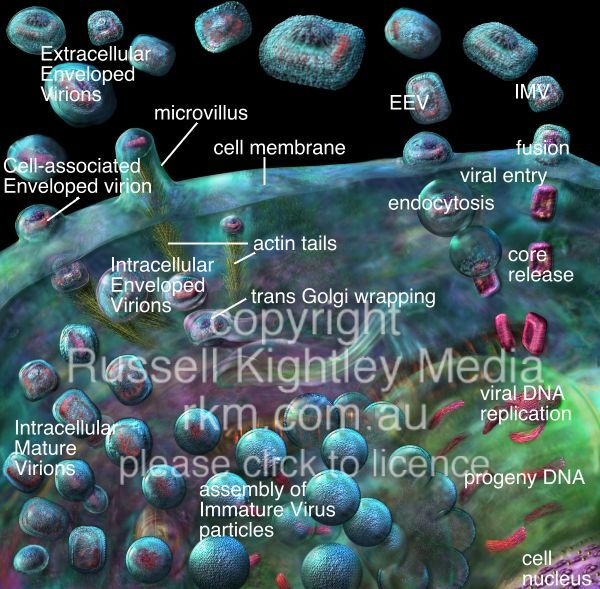 EXPLANATION OF PICTURE: At upper right, virus particles land on the cell surface and are taken into the cell. The genetic information (DNA) of the virus is released into the cell and begins to make copies of itself. These new DNAs are taken into the developing spherical viral particles and the particles mature internally (bottom left) and in so doing adopt a more block like appearance. Most will remain in the cell as Intracellular Mature Viruses, (IMV) and will be released when the cell bursts. However, some of the virus particles will obtain a second wrapping of host cell membrane. This occurs at the trans Golgi and can be seen just to the left of the centre of the image. These double wrapped particles are called Intracellular Enveloped Viruses (IEV). Using actin, which polymerises at their "lower" membrane surface, these IEVs push themselves through the cytoplasm and so arrive at the cell surface. Some IEVs push through the cell's plasma membrane and remain attached to the cell surface. These are called Cell-associated Enveloped Viruses (CEVs). Others that push through the membrane are released and are called Extracellular Enveloped Viruses (EEVs). Some virus particles continue their outward jouney on their actin tails by pushing the plasma membrane outward as microvilli, seen as a finger like projection towards the left of the cell surface in this image. These projections can become very long and make contact with other cells, thereby transferring infectious viral particles to them. The mode of entry into cells varies depending on the virus form. IMV particles seem to enter by fusion with the plasma membrane (extreme right of cell surface) whereas EEV particles seem to be taken into the cell by endocytosis, shown here as particles taken in by membrane "bubbles"